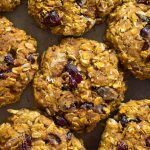 Soft, chewy, oatmeal and trail mix breakfast cookies, loaded with walnuts, dried cranberries, peanut butter, and even bananas! 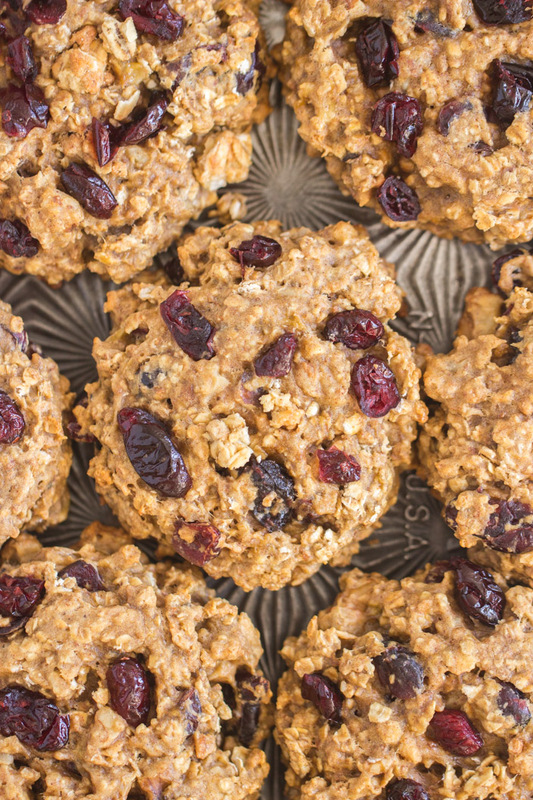 These Cranberry Walnut Trail Mix Cookies are nutritious, hearty, and filling. 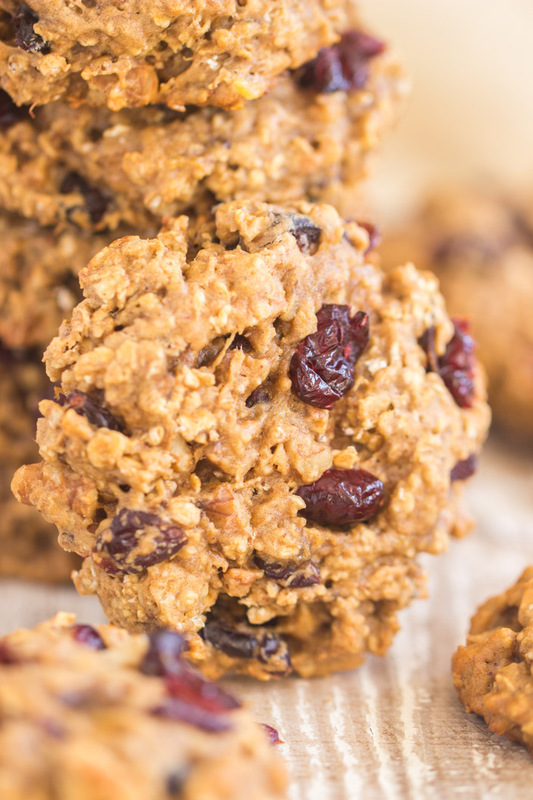 So many wonderful ingredients packed into these Cranberry Walnut Trail Mix Cookies! I love making breakfast cookies! You guys know this. 🙂 I have a bunch of breakfast cookies recipes on the blog now. They’re one of my favorite go-tos for quick, easy, filling breakfast on-the-go. I love that I can bake a big batch ahead of time, and have them packaged and ready to go for the week. I am all about meals that are portable! I never like to be caught without a nutritious snack. 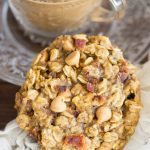 These Cranberry Walnut Trail Mix Cookies start with oats and oat flour, then I add a bit of peanut butter (though you can use whatever nut butter you’d like! 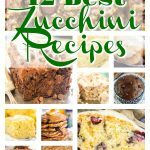 ), mashed bananas, dried cranberries, walnuts, cinnamon, and a few other odds and ends. So much good stuff crammed into these! I also added the NEW Grape Nuts Trail Mix Crunch right into the batter, and so these are extra power-packed with nutrition. 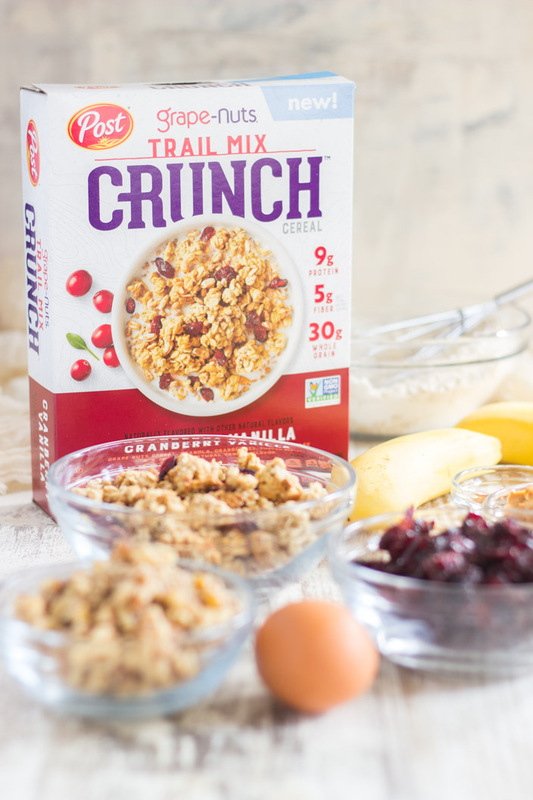 You’ll love the bites of crunchy trail mix granola from the Grape Nuts Trail Mix Crunch. They really set these cookies apart in terms of taste and texture! The little nuggets of delicious granola are such a nice complement to these otherwise soft, chewy cookies. 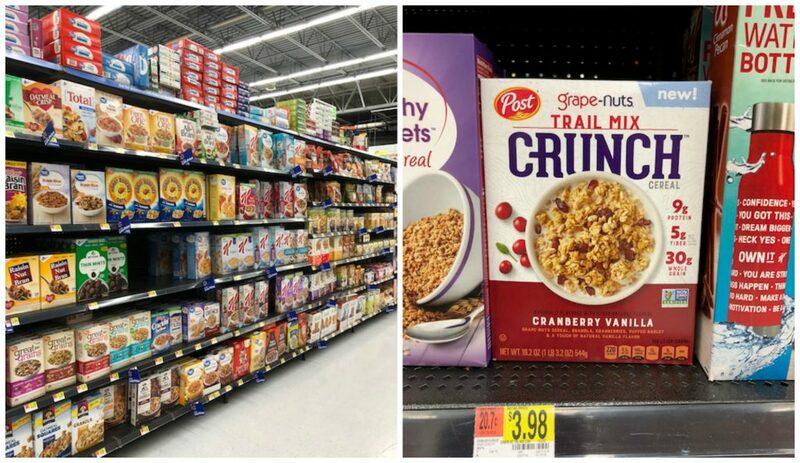 The NEW Grape Nuts Trail Mix Crunch is naturally flavored vanilla granola, Grape Nuts (of course! ), sweetened dried cranberries, and a touch of puffed barley. The vanilla and cranberry flavors pair with these Cranberry Walnut Trail Mix Cookies perfectly. I’ve always loved classic Grape Nuts, and I’m definitely enjoying the new Grape Nuts Trail Mix Crunch. 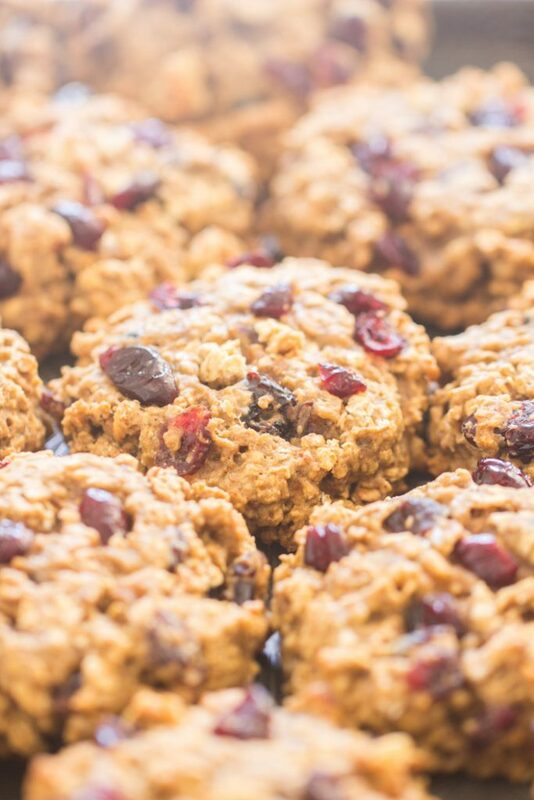 Start your day off right, and fuel your day properly and nutritiously with Grape Nuts, and these Cranberry Walnut Trail Mix Cookies. 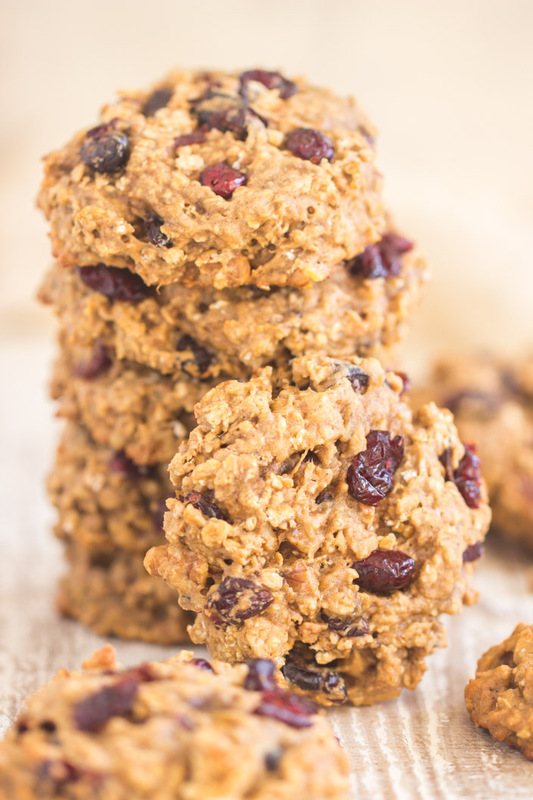 These Cranberry Walnut Trail Mix Cookies are super simple to whip up, and only take about 30 minutes start-to-finish, but they’re packed with fruit, nuts, healthy fats, and wholesome grains. I found Grape Nuts Trail Mix Crunch at Walmart, along with everything else I needed to make these Cranberry Walnut Trail Mix Cookies. I love that I can grab all the ingredients I need for these cookies in one place. 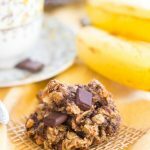 For other breakfast cookies recipes (I’ve got just a few!!! ), check out these Cranberry Pumpkin Breakfast Cookies, Peanut Butter Bacon Breakfast Cookies, or Chocolate Peanut Butter Banana Breakfast Cookies! Those are a few of my faves! In a large bowl, whisk together oats, oat flour, brown sugar, baking powder, baking soda, cinnamon, and salt. In a medium bowl, whisk together mashed bananas, eggs, peanut butter, and vanilla. 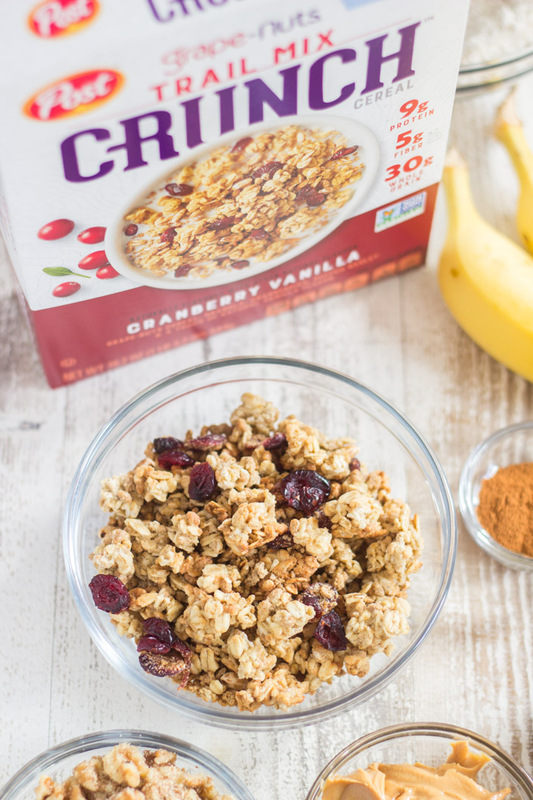 Fold in the walnuts, cranberries, and Grape Nuts Trail Mix Crunch. 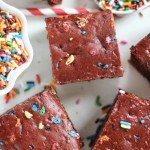 Drop by golf ball-sized scoops onto parchment paper or silicone mat-lined baking sheets. Bake at 350 degrees for 12-15 minutes, or until cookies are lightly browned. Store in a cool, airtight container. These are great warm from the oven, but also at room temperature, and even refrigerated. Whole wheat flour or all-purpose flour can be substituted for oat flour. 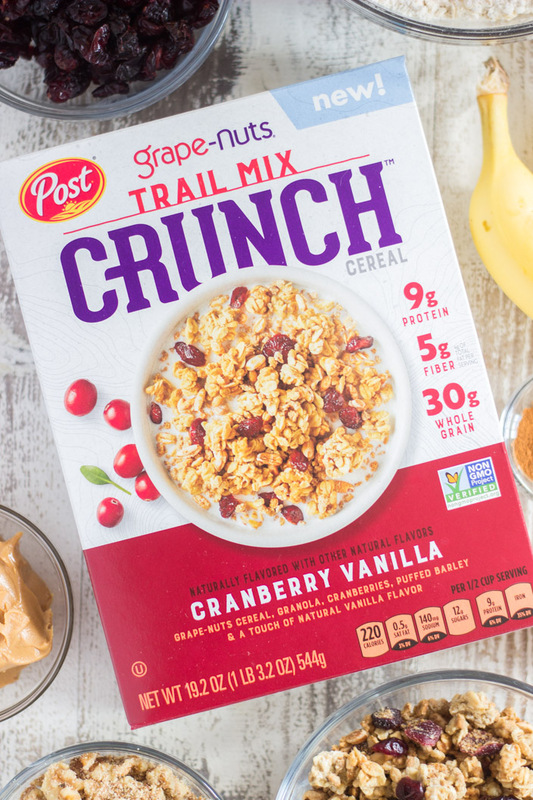 Check out Post on Pinterest to learn more ideas for fueling your day with Grape Nuts and other Post products! Also grab the coupon through this Ibotta link! For this fecipe, high altitude adjustment? I’m really not that familiar with high-altitude baking, unfortunately. I’m sorry! I did a quick Google and it looks like you’d reduce baking soda slightly, and increase baking temp about 25 degrees. I wish I could be more helpful!